Being a former resident of Michigan for most of my life, the great lakes and her freighters have always been a part of my life. I worked and lived along the St. Clair River and her connected lakes and spent many days watching the freighters make their way down the river on their way to Lake Erie and up to Lake Huron and on. When the Edmund Fitzgerald sank with all her crew up in Whitefish Bay I remember the very moment the news broke and just what I was doing then. A modeler had a model of the Fitz that needed a protective case and I was asked to build for her. Here’s the finished display and I’m happy to say I’m truly proud to be a part of this memorial display. The case has an oak base finished in a natural finish. This customer wanted a really large case and I recommended the kit option which he agreed was the best option. It was the only way to ship it to him as a display case with the all acrylic cover on the base would be too large to ship by ground UPS and would have had to be crated and shipped freight which would have resulted in damage and mishandling. I think this is a great representation of what’s possible when a really large display case is needed. How is a Custom Display Case Actually Created? Creating a custom display case requires a ton of patience, measuring and re-measuring, operating and maintaining power equipment and a ton of desire to produce a product that not only the customer will be pleased with but you as well need to be totally pleased. Every case I build must have the quality that I personally would be proud to display in my own home. 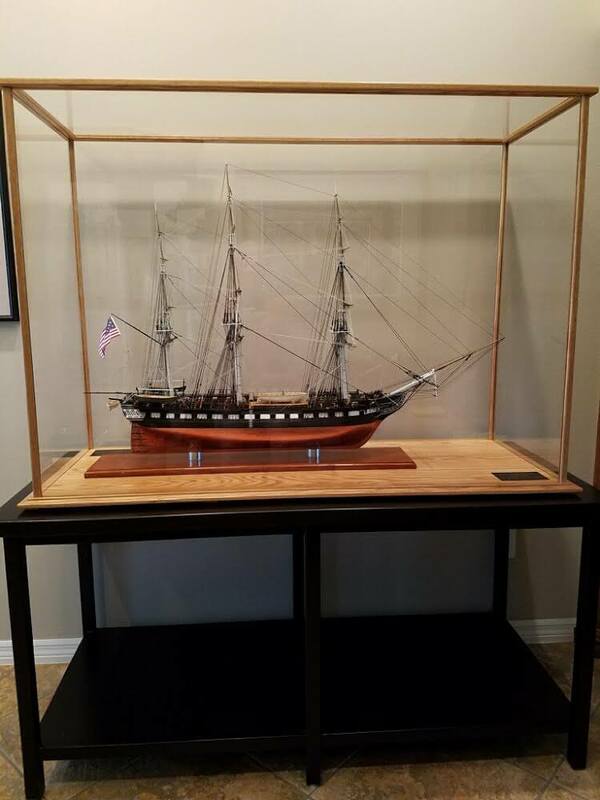 After all, when someone has something to display that has very special meaning to them, or a model builder has spent hundreds of hours building that one of a kind model, it must be protected and displayed with the same attention to detail and quality that went into their memorabilia. To detail just how I go about building a custom display case, I’ll start with some steps I take to get all my ducks in a row. The first thing is to take a moment to determine the overall size of the acrylic sheet I’ll need for an individual case. Because I heat bend the acrylic to form a three sided box with no ends, I must allow some acrylic to allow for the bend and still maintain the dimension the customer wants their case to be. Once I’ve determined the size I need, I use a very special saw blade just for cutting acrylic and I cut the material allowing a little extra. This is to allow me to run all edges over my jointer to get the smoothest edges possible to reduce the bubbling effect that appears whenever you weld acrylic. Ron now works with the optical quality acrylic on the bending jig, creating the cover to fit the oak base. Now that I have the acrylic cut to size, I take it back to the table saw where I score (cut a very shallow line) the acrylic where I want it to bend when heated to the right temperature. I’ve designed and built my own bending jig which allows me to get perfect 90 degree corners for a more precise finish on all my cases. Now that the acrylic is scored, I place it over the heat rod for a period of time, and never too much or too little as that makes a perfect bend not possible or the acrylic burned or warped if too long. When it’s just right, I form the right angle edge and let it cool. Next, after the two bends have been made, I cut the end pieces of acrylic and weld them onto the ends of the three sided box to form a box with one open side that will become the bottom that sits on the solid hardwood base. This is allowed to dry for at least two days for a solid weld. The oak base has been routed and sanded to desired finish quality, and a final coat of polyurethane clear coat is applied. I then go to the base. I choose the best, flattest and straightest piece of wood with a grain pattern that is pleasing to the eye and cut it to a rough size. After I’ve jointed and planed the wood, I cut it to it’s final size based on the opening of the acrylic cover. It is often the case when I have to glue up multiple pieces of wood to create a base wide enough to accommodate the acrylic cover which I can do easily. Actually, with wide bases, the more pieces used to create the wide enough base, the better as that prevents warping, bending and twisting later in it’s life. 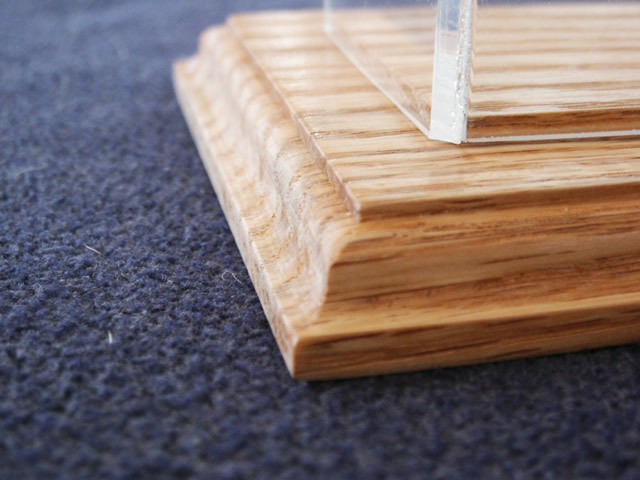 I then run the outer edges through my router to create the beautiful edges with soft curves and a raised platform for the acrylic to sit over to prevent it from moving around on the shelf when displayed. Lastly, this is sanded and smoothed for finishing. I stain every base to the color the customer desires, and I apply at least 2 topcoats of satin polyurethane to the finished base for a finish that’s soft to the eye and provides great protection. 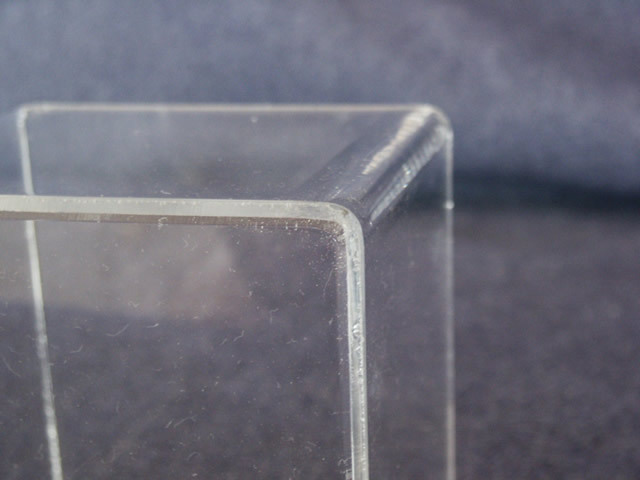 To finish a custom display case, the last step is to run the acrylic cover through the router to round over the edges where the two ends were welded on so ALL edges have a rounded over finish so there appears that the acrylic was formed rather than constructed. It’s one extra step that I feel gives a much more professional look to the finished case. The very last thing is to flame polish the routed edges so all surfaces are smooth and glossy. So, you can see, building a custom display case is a work of art in itself, and I personally take it very seriously. Every case leaving here is created by me personally. I’m a one man company who believes every customer deserves the best possible work and it’s my job to guarantee they will get just that. If I wouldn’t place it in my home, I would never send it out to your home, period. Please contact me with any questions about my work, service and quality anytime at ron@grandpascabinets.com. I’d love to hear from you and work for you in the very near future. An antique pocket watch needed special care and protection. The customer was very pleased with the result. I was asked to produce an acrylic cover to sit over a diorama of a circus train a while ago and really didn’t think much of it. The customer, Rick Liblong said he made a diorama of a circus train, The Greatest Show on Earth complete with all the animals and people shown. I made the cover to protect his work of art and after a period of time, I received some photos of his work under my display case cover. 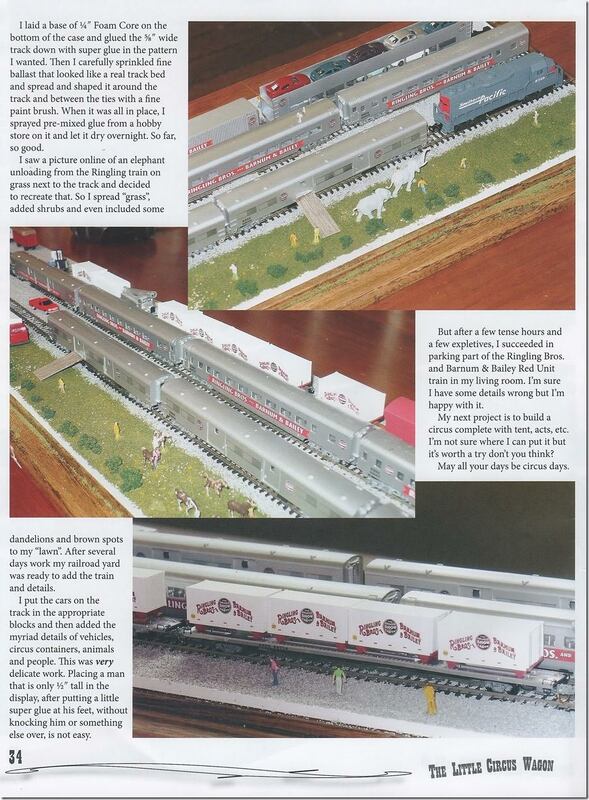 Well, just this week I received an email regarding his diorama being featured in the magazine, “Little Circus Wagon” magazine complete with tons of photos and his editorial regarding his work on this. He was gracious enough to give me a mention regarding the display case cover which I truly depend on and really appreciate to get my name out to others needing a quality affordable custom display case for their art and collectibles. Rick stated he was always interested in the circus but was unable to get near one as a child so he decided to bring the circus to himself. Well, not actually but looking at his work with the diorama, he pretty much achieved his goal. Even the people shown and animals are to scale and the trains are N scale with the longest car being only 8″ long and the people figures only 1/2″ high. He did all the building and painting himself. I hope you like the photos of this work of art as much as I did. Grandpa’s Cabinets has been asked to build custom display cases for a myriad of items including and not limited to model car display cases, diecast model display cases, model railroad display cases, model train display cases, antique pocket watch display cases and even remembrance cases for memorabilia of deceased loved ones. If it needs protecting, Grandpa’s Cabinets can and will build the custom display case to accommodate your needs. The shapes of these various cases varies as with the model train or railroad display cases are long, narrow and not too high and the model car and diecast cases are short, narrow and again, not too high. The memorabilia case can be just about any shape or size depending on the items being cherished or displayed. 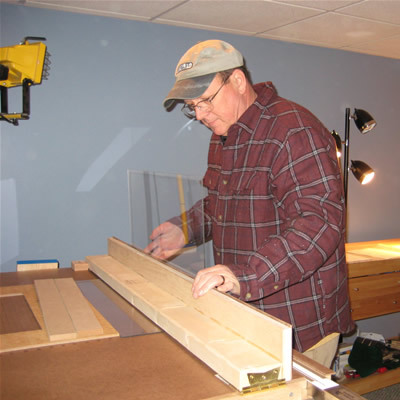 Below are a few examples of the various types of model display cases that Grandpa’s Cabinets can build. Here are a few of our favorite diecast model displays. If you’re interested in any of our custom display cases, please submit a custom order request and we’ll respond with a quote. At Grandpa’s Cabinets, we often get requests for custom wood work. If you’re interested in a custom bookcase, entertainment center, and special display case, please contact us. 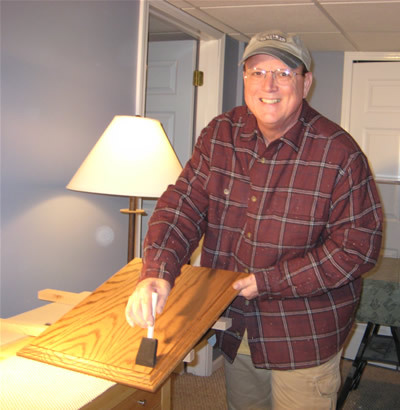 I’ve been building furniture in hardwoods for most of my life, and necessity has always been the stimulation for building, purchasing tools and equipment to make the projects possible, and learning the “tips of the trade”. My favorite works are in the cabinet area, and as the photo of the home entertainment center shows, size is not a problem. Necessity was the push for this project. My wife and I purchased our first large screen TV, and had it sitting against a wall. After looking at it just sitting there, I decided to look online for what’s available to encase this piece, and hold the other audio components in style. The Amish offered the nicest pieces in bridge cabinets, which is how this cabinet is designed, and they use only solid hardwoods. So, the birth of a cabinet happens. I’m located in Florida, and for anyone interested in a piece of custom built hardwood furniture, hope chest, coffee table or that special case, I am always available to build, but please consider the shipping costs and restrictions. I’m proud of my one man enterprise and try to pass the efficiencies onto my customers versus the traditional brick and mortar companies. I run a complete woodshop and I do this as a passion that yielded the custom display case offerings. Hundreds of model builders and collectors have used my display cases and I’d like the opportunity to build a custom piece of furniture for you! Below are just a few samples of our custom work using the same high quality techniques found in our custom display cabinets. These custom display cases are made of a an optical grade acrylic that is crystal clear and of the highest quality. I only use solid oak for the display bases, trim, and never use veneers or laminates. The customer benefits from fast production as I only need 5 to 7 workdays to produce any custom case order. 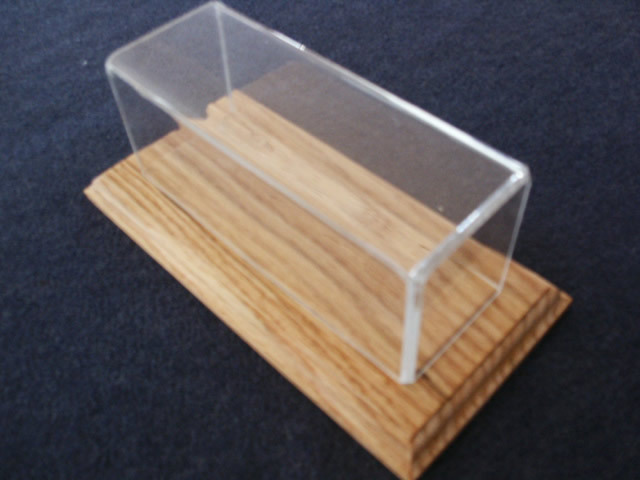 The full acrylic display cases are custom built and can be ordered with or without a beautiful oak base. Every display case is built custom made to the exact size the customer desires and needs. You’ve worked hard on your model and want to protect it from accidential bumps or scratches. 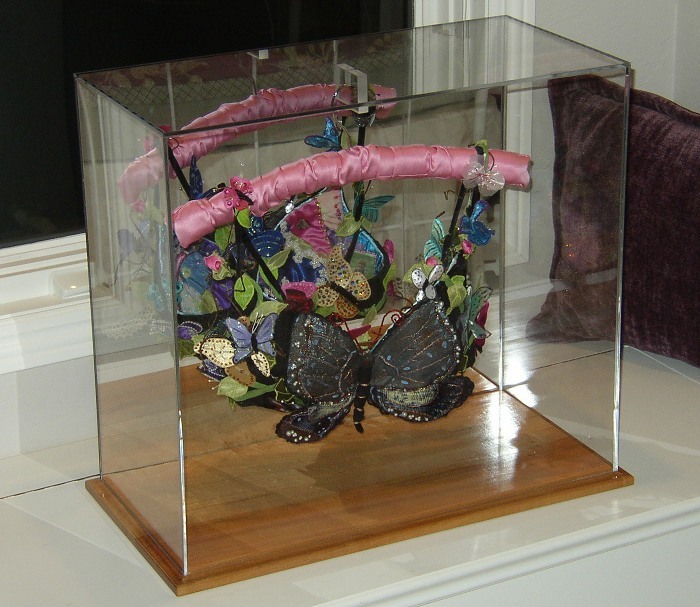 Custom display cases protect your model art from curious fingers seeking to touch your model while providing an artistic look worthy of a museum piece. 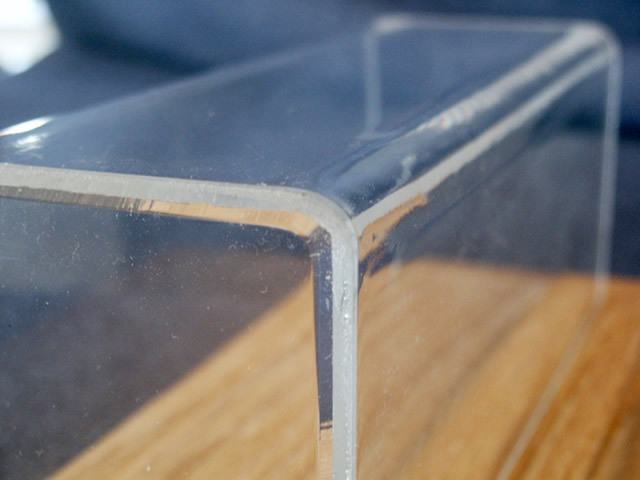 The clear top and sides are a minimum of 1/8″ optical grade acrylic that are placed and formed to attain a very precise finished interior dimension. Customers use these acrylic display covers to “exactly” fit over an existing base. 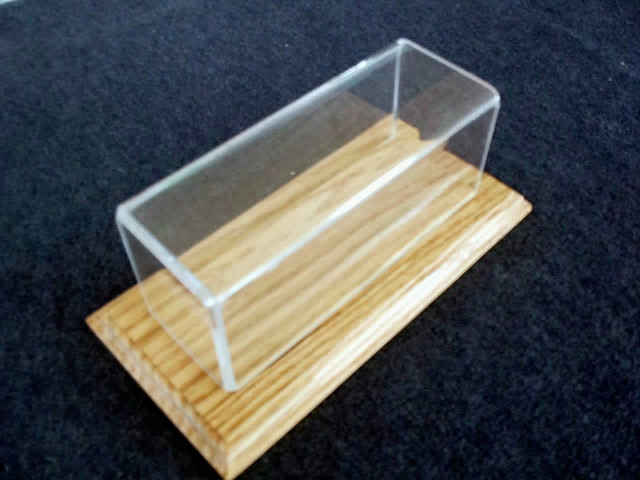 Display case can be customized to your exact specifications. We pride our selves on being able to satisfy our customer unique requests. Your model art is a unique representation of your hard work, diligence and talent. Our custom display cases are built to compliment the artwork as well as protect it. 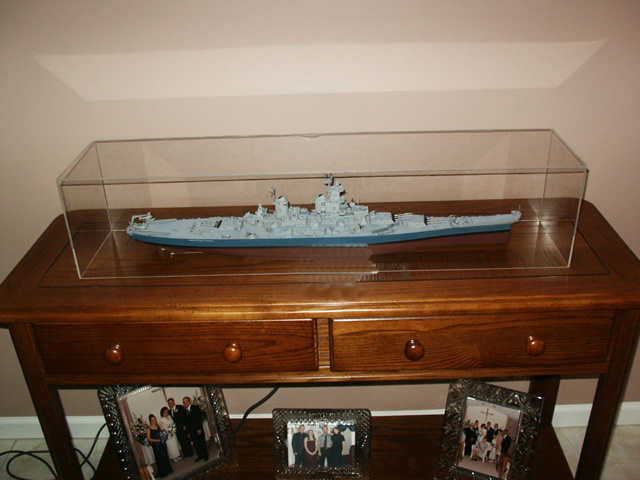 A display case protects your model art from curious hands as well as the bumps and scrapes found in a home. Click on any image to view a larger picture of our display case. I design every custom display case with a look that provides smoother viewing and an overall better looking model display. For custom display cases under 40”, I use my bent edge style to add strength and rigidity while protecting the model art piece. If your display case is over 40”, then I use my constructed edge design which provides an equal amount of protection while enhancing the model art. In the photo’s above, you can get a sense of what the construction process entails. The long upper edges are actually bent and acrylic is affixed to the outside ends to complete a case. 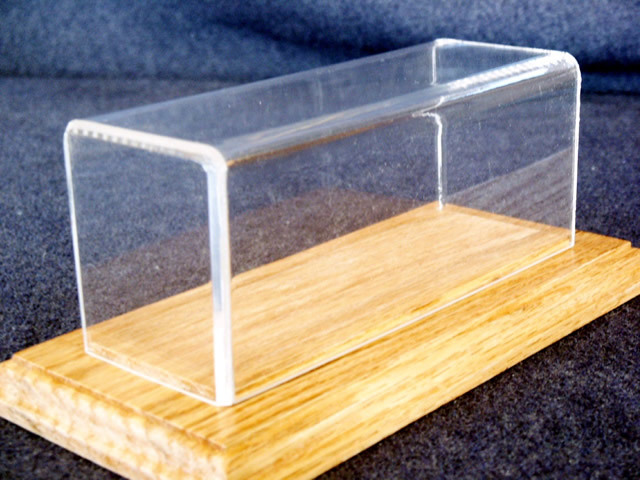 This involves heating the acrylic and using forms and jigs, creating the three sides of a display case top. This works well with the routed edge oak bases used for mounting your models, as you can see. I will always try to get as close to your specs as possible, but there will always be a little variation in the finished size of the inside of your case. However, the acrylic upper display case will always perfectly match the base no matter which option you choose. 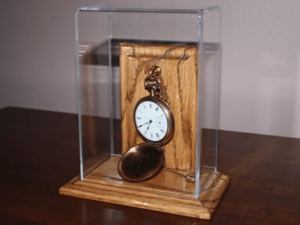 The acrylic oak base and trimmed display cases are often offered to customers who need a custom case that exceed shipping size limitations. The design is sold as a customer assembly kit, and the kit provides everything the customer needs to assemble their own custom display case as shown above. The acrylic is optical grade throughout and the wood is solid oak – no laminates or plywood! When a customer requires a display case for a very large model, Grandpa’s Cabinets has the answer. Shipping costs to send a case are already overwhelming, and when the box exceeds 130″ in length + girth, they soar! So, now I have designed a case that the customer receives in parts, and with some very easy assembly, they produce a beautiful, furniture quality, display case for those REALLY BIG builds. You receive everything you need, completely cut to size and finished in the stain color of your choice. All oak pieces are also top coated with a clear gloss polyurathane and no tools or glues are required to assemble this fine case. The acrylic is sent with the protective paper coatings attached to protect it from damage during shipping. When you have a large model that needs protection from everything, consider this option. You won’t be dissapointed with your choice. The case in the picture needed to be no taller than 48″, and a minimum of 36″ wide and 14″ deep to fit this customer’s sailboat . I was able to fit the 46 1/2″ tall boat into the case kit, and it ended up measuring 47 7/8″ tall overall. As you can see, it was literally 1/8″ short of touching the ceiling. We can build custom to fit any circumstances. Just had my niece and her husband come by and helped put the cabinet together. VERY SATISFIED WITH THE WAY IT FITS THE SHIP AND THE ROOM !!!! Received the case today. My wife and I could not be more pleased. The Design is fantastic and the care you took on packaging was above and beyond. Best money I have spent in a long time.